It is fully compatible with all evolution G1, G2 and G3 systems, ensuring our customers’ investments continue to be viable and pay off well into the future. The G3 range has been one of the best-selling wireless series in the global market, and with many user-driven improvements, high product quality and attractive price points, G4 will continue this legacy. Stop dreaming about power. G4 has it. The IEM, 300 and 500 series offer up to 50 mW RF output power (adjustable in 3 steps: 10/30/50). Portable Broadcast & Film sets benefit from 8 hours battery power – G4: a reliable partner on every set. Versatility is key. G4 offers the highest amount of flexibility for all possible applications. 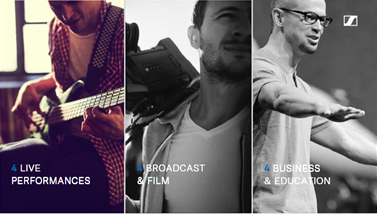 Live Sound, In-Ear Monitoring, portable solutions for ENG and professional film productions. It is your partner on every congress, meeting or university lecture. G4 is mobile. G4 is always on air. A system that simply grows with your demands. Everyday. Evolving with you. G4 is beyond expectations on its price point. A switching bandwidth of up to 88 MHz (300 and 500 series) literally enables you to go everywhere your job takes you. 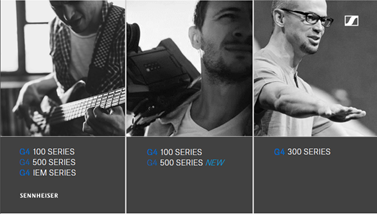 G4’s 100 Series enables you to link up to 12 receivers for simultaneous easy-setup, saving valuable time. G4’s intuitive LCD and OLED (IEM, 300 and 500 Series) displays make lives easier in every environment. G4 is making the connection. The LSP 500 is your mobile wireless speaker joining you on every job, a broad range of accessories accompanies the system, and integrators adore its versatility when it comes to workflow and control software such as the WSM (Wireless Systems Manager) and the Sennheiser Control Cockpit on mobile devices. When it comes to hospitality, education and events, G4 is your mobile solution that fits easily into every room and workflow. 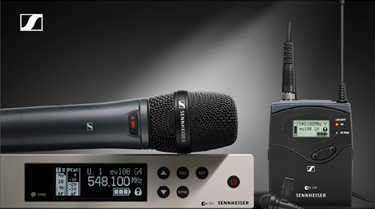 When on the road, documentarists or journalists know that G4 fits into every pocket and provides powerful speech intelligibility during the whole interview or report.